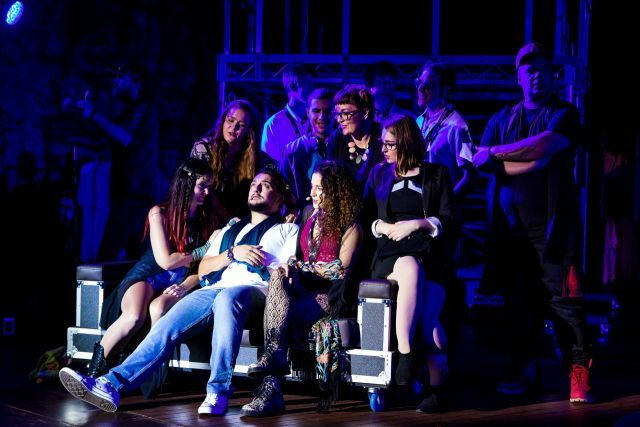 Platinum Entertainment’s Jesus Christ Superstar is set at the Superstar Music Festival, which features the headline acts, Jesus, Judas and Simon Peter. Set in the present day with the set and props including mobile phones, social media references and uber eats, the extended metaphor continues throughout the show without messing with the original script, as the priests become the executives at Priest Records, Pilate is a festival producer and Herod a talent agent. It is a fresh interpretation which adds extra interest for those familiar with the production. 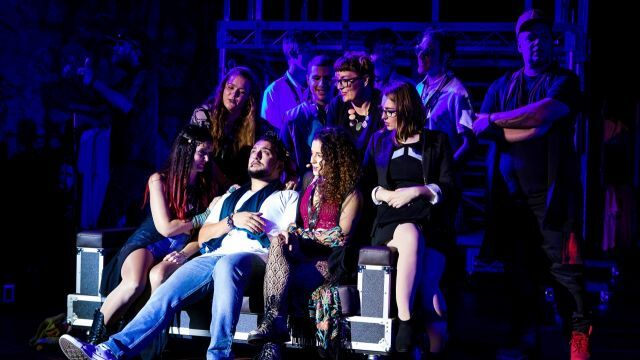 Vin Trikeriotis brings stunning vocals to our rock star Jesus Christ, leading the cast in a confident and impressive performance. Sam Rabbone creates a very layered Judas in an impressively acted and sung portrayal. Clay Darius is a strong Simon Peter. Jamie Mercanti’s Pilate is formidable and vocally strong, while Paul Whitehead’s Herod lights up the stage in a fun rendition of Herod’s song, assisted by a gorgeous chorus of dancers. The Producers at Priest Records, Caiaphas (Andrew Milner), Annas (Ash Schofield), Aaron (Dan Millgate) and Kohen (Luke Miller) are a solid team who work well together. Mary Magdalene is very sweetly played by Genevieve Wilson, who has a beautiful voice, although the relationship between Mary and Jesus is less clear in this incarnation than in many productions. A strong supporting cast of disciples, security, angels (who led the dancing), festival goers (the ensemble) and event staff (choir) performed enthusiastically throughout. Frank La Cava leads a very solid “headliner band”. The Quarry Amphitheatre is an outdoor venue, which adds to the festival feel. On opening night the wind was playing havoc with the mikes, which was forgivable, but some sound cues were late or missed which was disappointing. On the whole though, the celebratory and indeed festival atmosphere was a delight. A fun way to kick off the Quarry’s summer production season, a fundraiser for a great cause (Heart Kids) and a fresh look at a rock classic, there is lots to like in Jesus Christ Superstar.